Centre assistant Debbie Watt inspects the new display. A north-east heritage centre has reopened for the year with a new exhibition detailing its town’s fine tradition of junior arts. Volunteers at Fraserburgh Heritage Centre, on the town’s Quarry Road, have been working since the attraction closed for the winter to get the facility ready for the summer season. 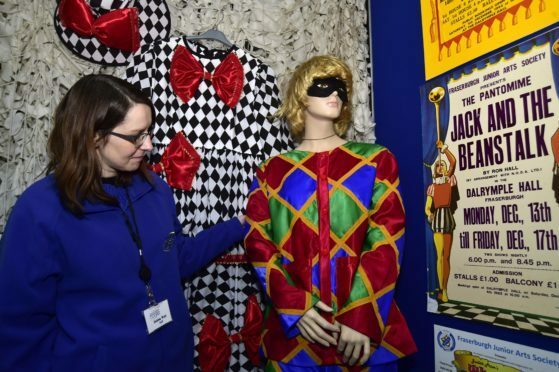 And this week it reopened with a brand new exhibit to celebrate another institution in the town, the Fraserburgh Junior Arts Society (FJAS), which has been active for more than 65 years. The special “panto time” display celebrates the hundreds of shows FJAS has laid on over the years. “Once again the volunteers who man the centre have done sterling work in preparing all the exhibitions for the new season,” volunteer Chris Reid said. “We celebrate more than 400 years of Broch history and we strive to ensure our displays always remain fresh every year to keep visitors coming. As part of the new displays, a photographic exhibition showcasing the panto performers who have lit up the town’s Dalrymple Hall is centre stage. Panto dames of years past are among those that feature. The heritage centre is a four-star visitor attraction and offers insight into the history of the town and its forefathers. Displays include an old harbour master’s office, cooperage workshop and Guglielmo Marconi’s wireless shack. Marconi, a radio pioneer, conducted some of his earliest experiments in Fraserburgh and today has a street named in his honour. It also has displays for the town’s lifeboat volunteers and information about local celebrities including sportsmen and Bill Gibb, a Scottish fashion designer who created clothes for the likes of model Twiggy. The heritage centre will be open daily until October 31.